This collection of fun graphics is perfect for your Valentine project needs. 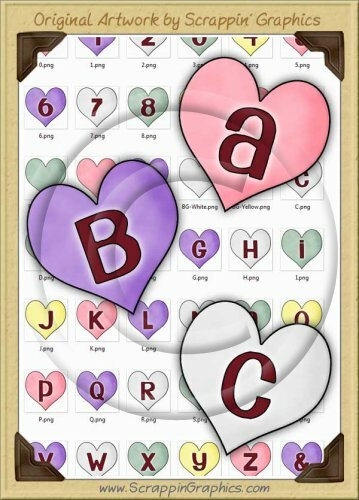 This set includes 40 different graphics of 26 red uppercase letters, 10 numbers, question mark, exclamation heart & ampersand stamped in Candy Hearts of various colors - pink, purple, green, white & yellow. Also includes blank hearts in each color. Great collection for web design, making scrapbook pages, cards, labels, tags, invitations, and other printables. Graphics can be used for commercial use but CANNOT be used to make other candy heart sets or alphas.